Starting this Saturday, thousands of playing children will descend on parks and playgrounds across the country for our national celebration of play. Nearly 1500 communities have rallied to show their commitment to the cause by hosting a Play Day—a day of games and playful activities, as well as an opportunity to improve local playspaces. 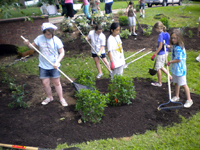 We’re excited to partner with The National Environmental Education Foundation (NEEF), which is also mobilizing people to improve outdoor spaces on Sept. 25, its National Public Lands Day (NPLD). Hundreds of NEEF groups are joining forces with KaBOOM! to combine service and play for a day of family fun. If you’ve never seen a dancing kite, here’s your chance. Hosted by Quad Cities Kite Club, this Play Day will feature “giant 100-foot show kites, stunt kites dancing to music, and single line kites,” not to mention Rokkaku kite battles and kite building workshops. To join any of these Play Days, or to find a Play Day near you, visit playday.kaboom.org.